I'm local tour guide in Northern part of Thailand with TAT license 23- 05066. I like places that calm, peaceful and No tourist traps. I'm happy and enjoy when you have a good trip with me. I hope my experiences in this field will be a good advantage. Welcome to Chiangmai. 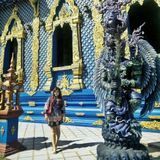 Trips created by Nathlita B.
Doi Suthep Temple, the Best Time to Visit. So much fun with Nathlita! We had one of the most fun days ever with Nathlita. She was a very friendly and knowledgeable guide. She helped us navigate the falls and took lots of pictures for us, but also gave us plenty of time to explore on our own. On our way home, she made a stop at a restaurant that the Thai Princess visits for khao soy and it was incredible. Her English is pretty good and she enjoys practicing with her guests. Highly recommend!